Overlooking the Alps in St Martin-Bellevue, the Beau-Sejour provides comfortable rooms and furnished apartments. It features 2 bars and 3 outdoor terraces. Each room and apartment at the Hotel Beau-Sejour is equipped with Wi-Fi internet access and a private bathroom. The apartments are independent from the hotel and have TVs and equipped kitchens, some have a balcony. The Beau-Sejour offers many services including a laundry and room service. 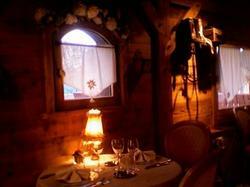 The hotel is a 10-minute drive from Annecy and 30 kilometres from Geneva. Please note that the hotel's reception is closed on Sunday evenings and on Mondays. There is no daily cleaning service and apartments are to be left in a clean state as on arrival. En suite room with flat-screen TV with satellite channels, a balcony with a view of the garden and the mountains and a private entrance. En suite room with flat-screen TV with satellite channels, a balcony with a view of the garden and a private entrance. Two-rfoom apartment with flat-screen TV with satellite channels, a balcony with a view of the garden and a private entrance. En suite studio with flat-screen TV with satellite channels, a balcony with a view of the garden and a private entrance.